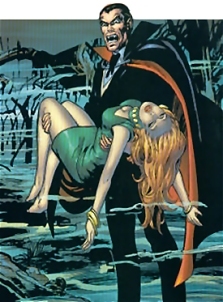 Born Vlad Dracul in 1430 in Transylvania was the second son of a Transylvanian nobleman. He became ruler while still a child. Over the next several years, he struggled against the Ottoman Turks, losing and regaining his throne. In the 19th century, he faced opposition from Abraham van Helsing and Jonathan Harker in England, the exploits of which were recorded in the 1897 novel by Stoker,Dracula. When the humans destroyed Dracula, his remains were placed in his coffin, concealed within a cave blocked by an enormous rock. Film adaptations have been numerous and has also become quite a character in comic books.